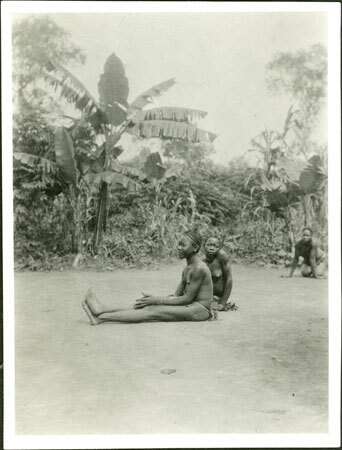 A portrait of a girl seated on the ground with legs outstretched and turned to the side (identified as wiri Bavongara, i.e. a daughter of Prince Bavongara, son of King Gbudwe, who died in 1905). Behind her are two less posed women, also sitting on the ground, looking towards the camera. Morton, Chris. "Portrait of a Zande prince's daughter" Southern Sudan Project (in development). 03 Jan. 2006. Pitt Rivers Museum. <http://southernsudan.prm.ox.ac.uk/details/1998.341.584.2/>.